And I mean EVERY student! Click the arrow to see this quick video. 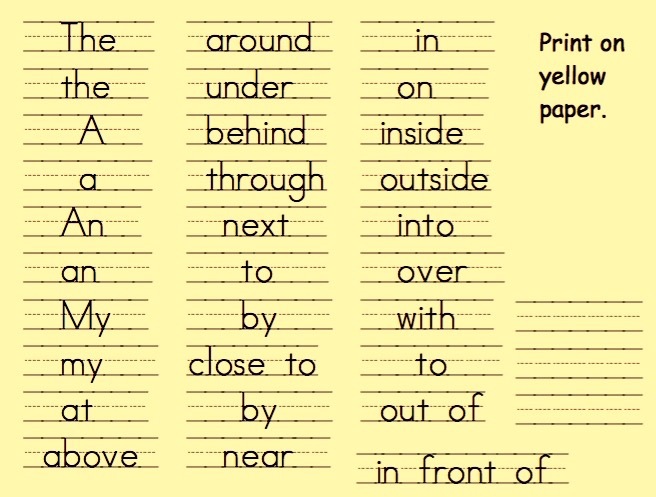 This method is great to develop oral language and give your students a foundation for composing a sentence. I used it with my English Language Learners as well as my fluent English Language students and they loved it. The best part is that once you have taught this method a few times in a small group setting, you can turn it into a fun writing center. 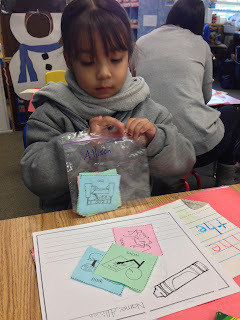 It starts with oral language as the student creates a sentence using the 3 cards they chose from a stack. 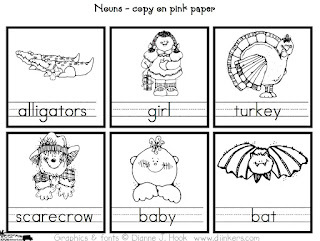 This is the noun page that your run on pink paper. 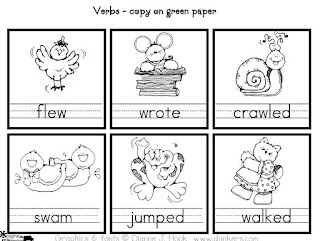 This is the verb page that you run on green. 4. Label all of the pictures. 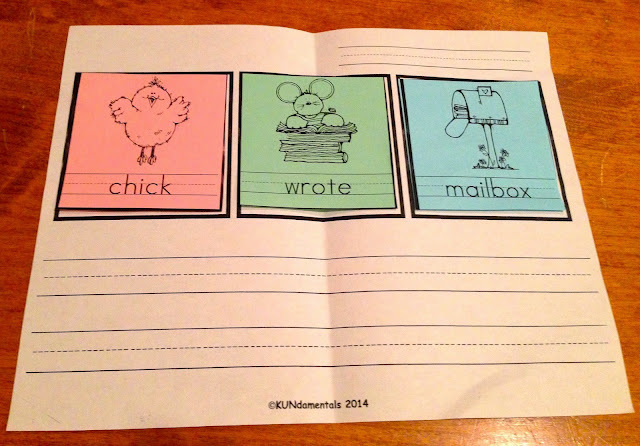 You might want to type up labels with a lined font so children can copy each label correctly. 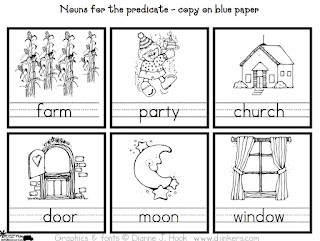 This is the 2nd noun page that includes places and things.You run this on blue paper. 5. Glue your collection of "characters" to pink construction paper squares leaving a 1/2" pink edge all around each picture. 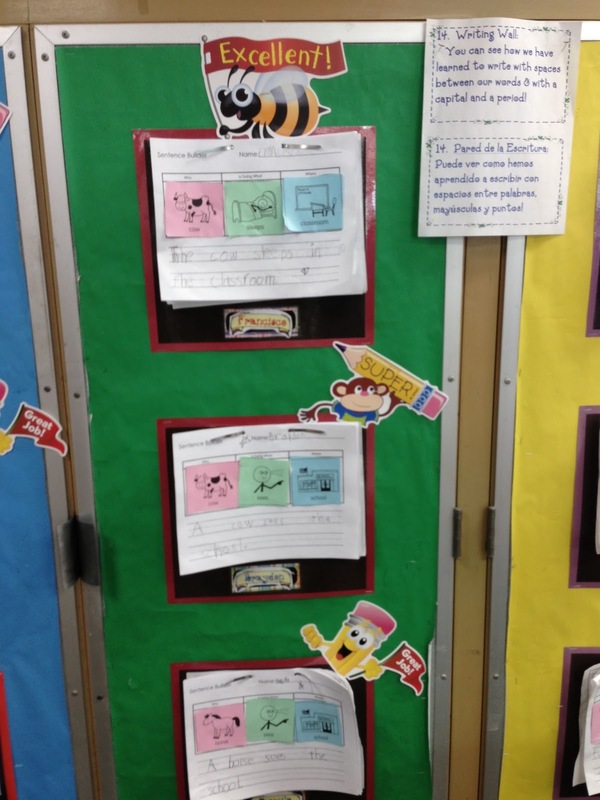 Do the same thing with the "activity" pictures, but glue those to green construction paper. Last, glue the "places" or "things" to blue construction paper. If you use my "Instant Writing" kit, you copy the pages labeled "pink" on pink Xerox paper, the ones labeled "green" on green Xerox paper, and the ones labeled "blue" on blue Xerox paper. 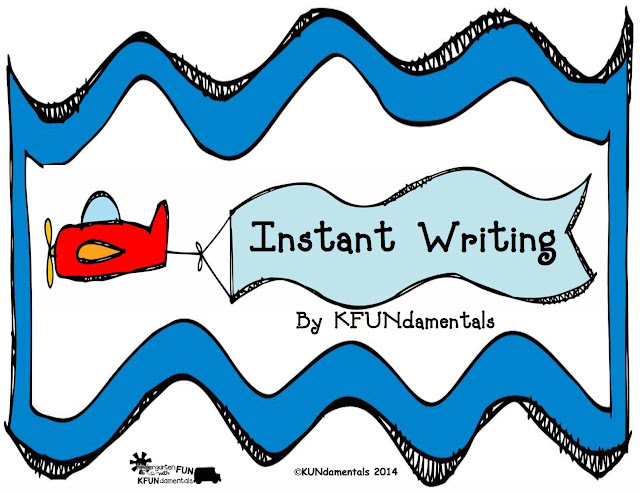 The "Instant Writing" kit includes the writing template, tons of graphics to copy on pink, green, and blue paper, and the "helping words" page. 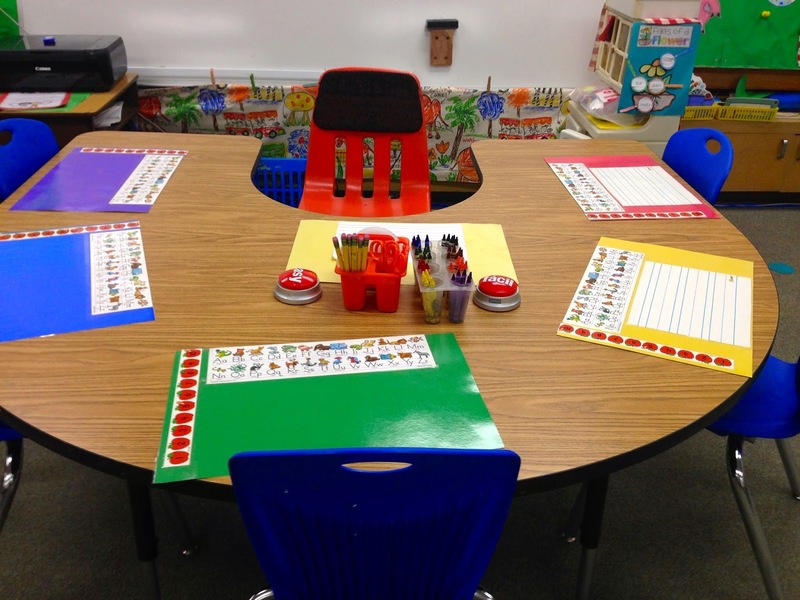 Each student will need one of the white templates in the kit or you can also use a sheet of lined paper with an area at the top for a picture. That is where your students can glue one pink, green, and blue card in that order. You will also need a list of "helping words" which is included in my Instant Writing kit. I run one copy for each child in my small group on yellow card stock and laminate it so we can use them all year long. 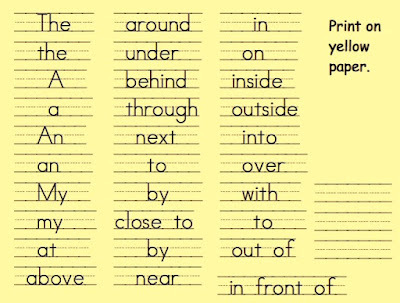 These include the words they will need to complete their sentence like "the, that, a, my, on, by, under, over, near, around, through,...". I included an image of the "helping words" page below. Scroll down to see it. 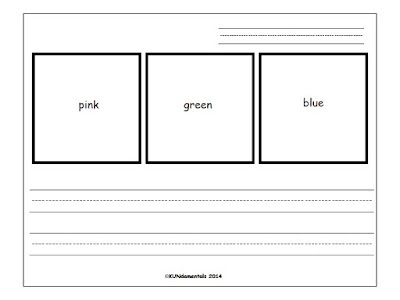 In a small group setting (of 4-6 students) give each child 1 pink, 1 green, and 1 blue page. Each page has 6 images on it. They should cut apart the pictures on each page and put them into a sandwich size zipper bag. (If you are using your hand-made kit, give each child 6 pink, 6 green, and 6 blue pictures to put into their zipper bags.) 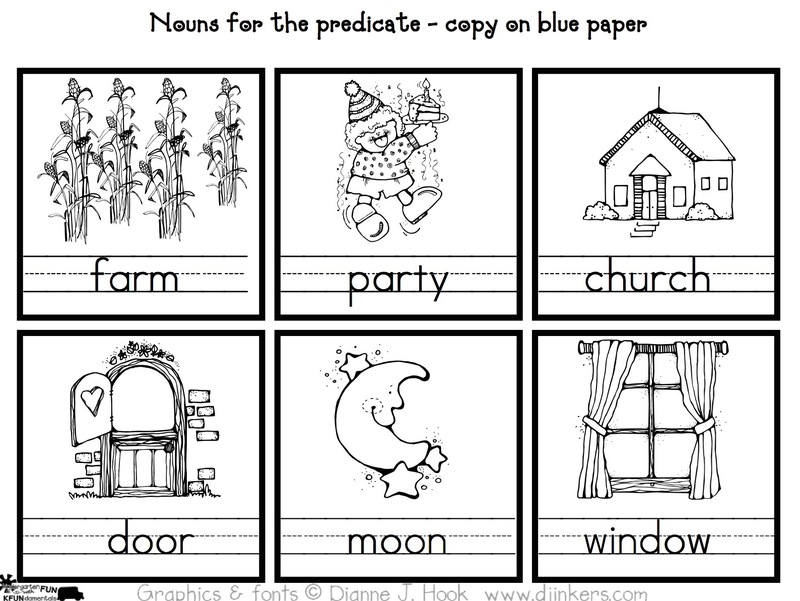 They will also need one white page for writing and a yellow "helping words" page. I was in the middle of attaching lined dry-erase contact paper to each laminated sheet of construction paper. The dry erase paper allows me to write words for students to copy and easily erase. They can also write on it, practice their printing, or work on a math problem and then erase it. Choosing one pink, one green, and one blue card. 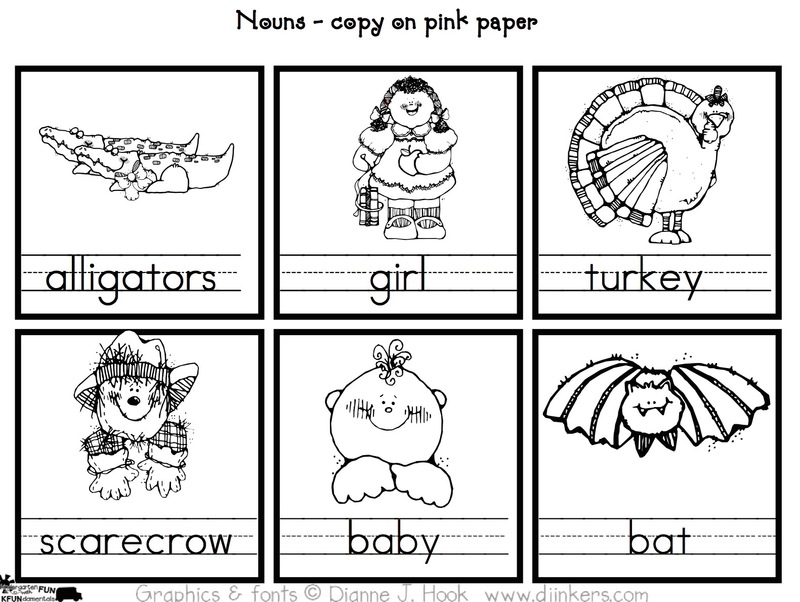 Help each child to tell you what each pictures is and have them verbally create a sentence using those three pictures. For example, if a child has a pink card with a cat on it, a green card of a girl singing, and a blue card of a kitchen, he/she might say, "The cat, sang in the kitchen." Or... "My cat is singing near the kitchen." There are so many ways to use each set of cards. Have fun and encourage them to create silly sentences like, "The black cat will sing to the kitchen!" Once they have settled on their sentence ask them which article (A, the, that, my, etc.) they wish to use and circle that word on their yellow "extra words" card so they can copy it. Then, they copy their pink labeled card. need a word, I just circle it with a dry erase pen. Next they write their verb from their green card. If they wish to change the tense, you just write the new word on the back of their card for them to copy. Last, they decide which "helping words" they need to add the last blue card to their sentence. You ask them if their character did that activity in, near, by, on, over, etc. the last noun. Use the "helping words" chart or write the extra words on a lined Post-it so it can be easily copied. At the end, sing this little chant which came from one of Heidi's teaching CDs which you can find at heidisongs.com: "I'm done, I'm done, oops, I forgot! 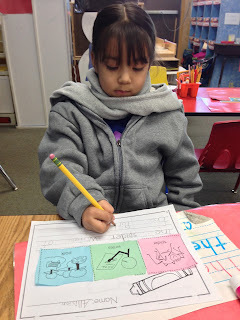 I have to write a period, I have to make a dot." 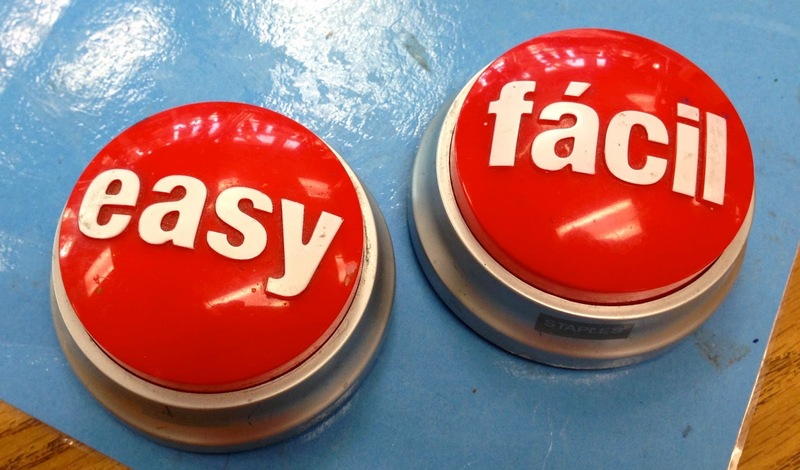 Then, your students reads their sentence to the group and they get to press the Easy Button! Available at Staples Stores in English and Spanish. Do this for 6 days (at least once a week for 6 weeks) before setting this up as a writing center. You can send these pages home, bind them in a book that they can take home after 6 weeks to read to their parents, or post them on medical file clips on your bulletin board. You can keep adding pages to these clips all year long. 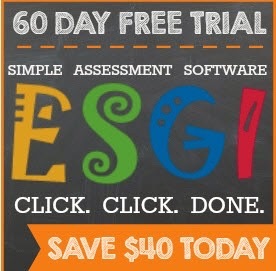 And here is a super discount code for you: Get $40 off of one year of the fabulous online testing, ESGI. Use code : KFUN at checkout when you sign up for your FREE 60 day trial and the credit will be on your account! CLICK HERE for more info, see the tests I wrote, and sign up for your free trial. 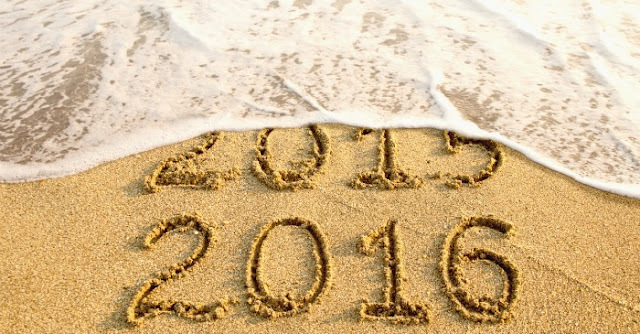 AND... have a Happy New Year!